The CEO Roundtables are implemented through the Florida PeerSpectives® Network, composed of roundtables throughout the state. Each roundtable brings together 10 to 12 qualified entrepreneurs ten times each year for collaborative problem-solving sessions that address issues important to their companies. Owners, CEOs, and Presidents share their management challenges, ideas, and experiences in structured confidential groups led by a trained facilitator. Don’t worry, we won’t pair you with your competitors! The peer participants share experiences and discuss techniques for overcoming obstacles to growth in every key business area, such as finance, employee relations, legal compliance, technology, and sales & marketing. If you are a business leader in a second-stage company, please fill out your CEO Nexus application today so that we can start working with you to grow your business. 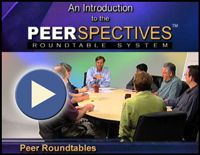 Every CEO Nexus Roundtable follows the PeerSpectives® Roundtable System model developed by the Edward Lowe Foundation. Highly productive, this model is based on proven best practices in the field of peer learning and has been custom tailored to meet the particular needs of growing second-stage companies. The foundation is committed to assisting the owners of growing, established companies with practical programs and expertise, emphasizing programs for entrepreneurs looking to take their companies to the next level. Our Volusia/Flagler chapter, powered by CEO Nexus, is a strategic business resource dedicated to serving second-stage companies in the community. We’re here to educate, inspire, support, and connect owners and executives who are on their journey of building great organizations. The CEO Nexus/WE, Women Entrepreneurs group, was founded by Judi Awsumb, President Awsumb Enterprises, Inc. to create a group of women entrepreneurs who want to accelerate the growth of their companies in a confidential, supportive, professionally facilitated environment where other successful women business owners can learn from each other for mutual benefit. Although most of our services such as CEO Roundtables, CEO Forums, and the CEO Referral Network provide assistance to second-stage companies, we also provide services for CEOs of first-stage growing companies. For more information, please view the Brochure and Case Study below, or attend one of our upcoming orientation events. To share this information with a friend, complete the form below.